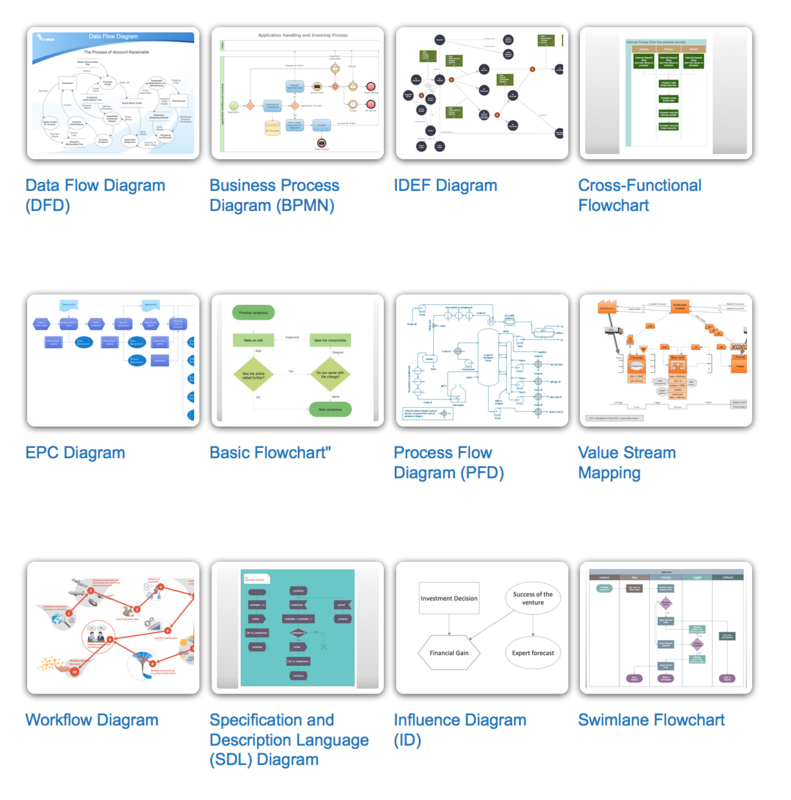 Here are brief summaries of the common uses of flowcharts and types of diagrams typically associated with them. 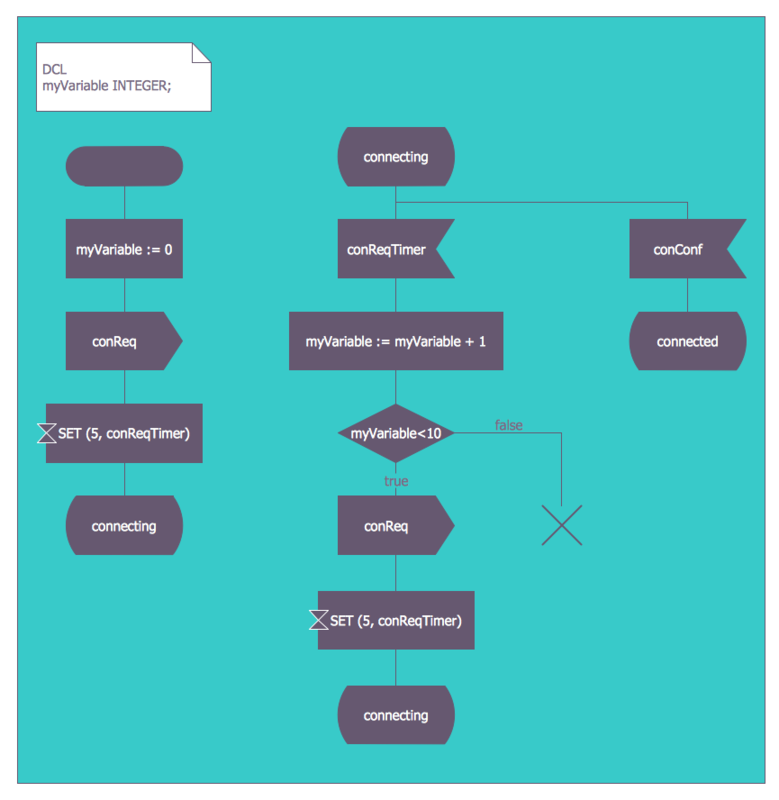 Basic Flowchart is a simple diagram of step-by-step execution of algorithm. It is used at the lowest level of business model description. Basic Flowchart is very simple and visual for creating and understanding. The simple algorithm shapes that represent the processes steps are used for creating the Basic Flowcharts and are connected by arrows that show the order of operations. Basic Flowcharts are widely used in the different areas of knowledge. 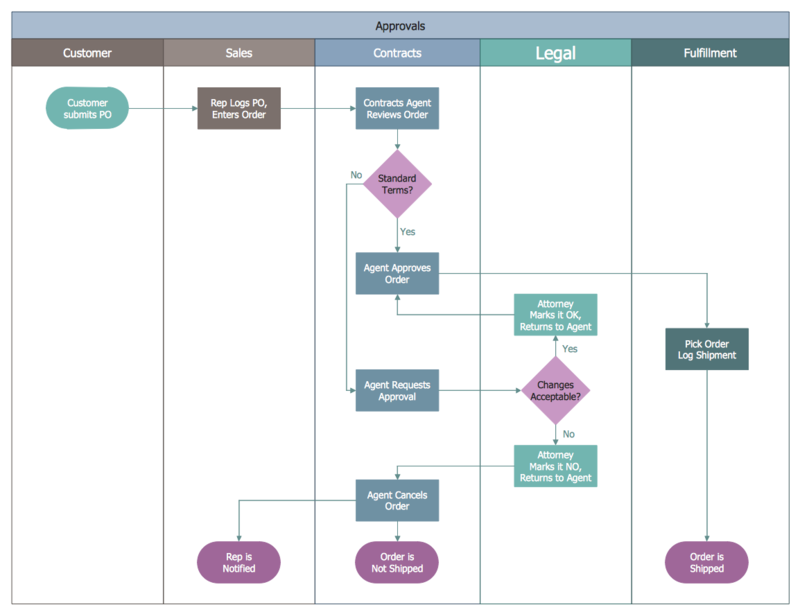 But Basic Flowcharts have also some disadvantages: the set of graphic elements is very limited, for example the participants of the business process are not marked on the chart. Business Process Modeling Notation (BPMN) is a standardized graphical notation that allows to create a graphical view of the business processes in a workflow. BPMN standard notation was developed by the Business Process Management Initiative (BPMI) to unify the expression of the business processes, to help all business users easily understand each other using the unified standard. It is a simple and visual tool for businesses and business processes, the common standard for design and implementation of business processes. In 2011 was standardized the BPMN 2.0. Until then was used the version 1.1. Cross Functional Flowchart (also called Deployment Flowchart) is a notation that is used to show the processes on the lower level of the business model. Cross Functional Flowchart displays the detailed algorithm of the business process execution, the participants of the process and the interactions between them. Cross functional flowcharts use the swim lanes that represent the functional units. They can be arranged horizontal or vertical. 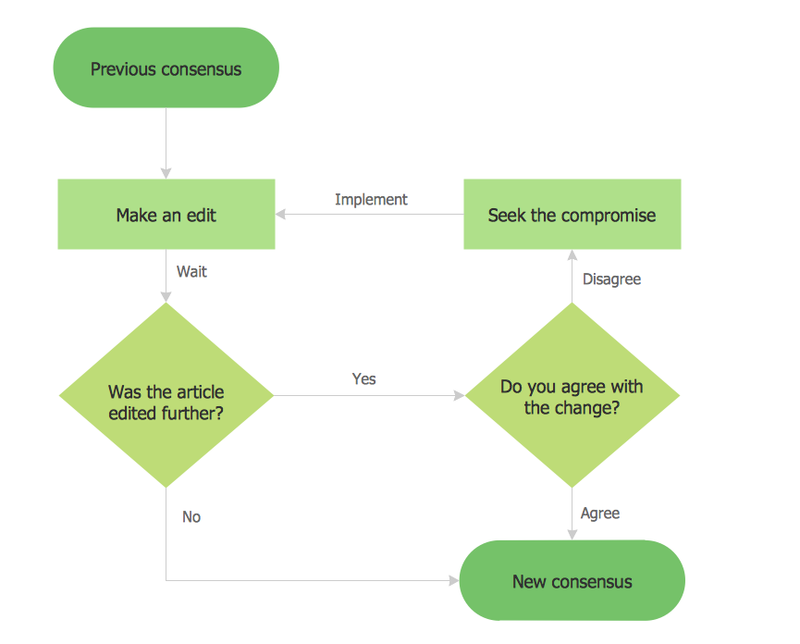 Cross Functional Flowcharts are very simple and useful, but demand a certain degree of detail. They are often used as the tool of the business planning. Data Flow Diagram (DFD) is one of the main tools for structural analysis and design of the information systems. 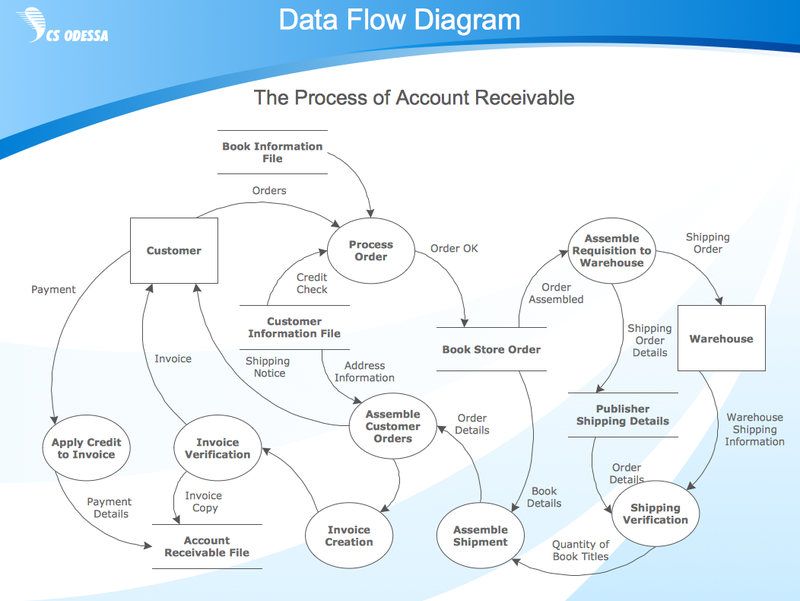 Data flow diagram graphically represents how the information system work and develop, the interactions between the system and external data sources in terms of data flows, the data flows that the information system receives from the outside. The DFD Model is a hierarchical model. Each process may be subjected to decomposition, i.e. divided on the structural components, the relationships between them in the same notation can be shown on the separate diagram. Two notations are used for describing the DFDs: Yourdon & Coad and Gane & Sarson. Event-Driven Process Chain (EPC) Diagram is a flowchart of business process modeling that uses the Events and Functions as key elements. EPC Diagram must start and end by the event. The function should always follow the event, i.e. the function creates a certain event (state). Documents, organizational units, process owners, information and control flows, elements of the information system have their graphic symbols. The various connectors are provided. For branching of the process are used the logical operators AND, OR, XOR. 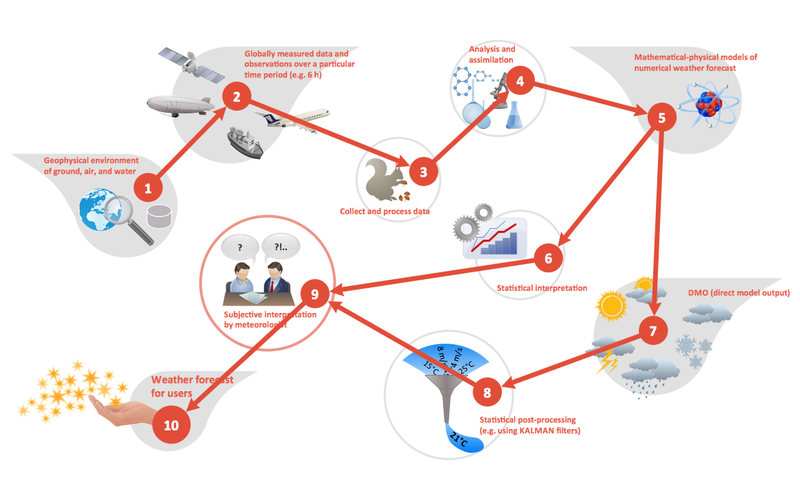 The Event-driven Process Chain method was developed within the framework of the ARIS (Architecture of Integrated Information Systems) that is used by the large quantity of companies for business processes modeling, analyzing and redesigning. EPC is used on the lower levels of business model description, when you need to describe the detailed step-by-step execution of the business process, all executors and used objects. 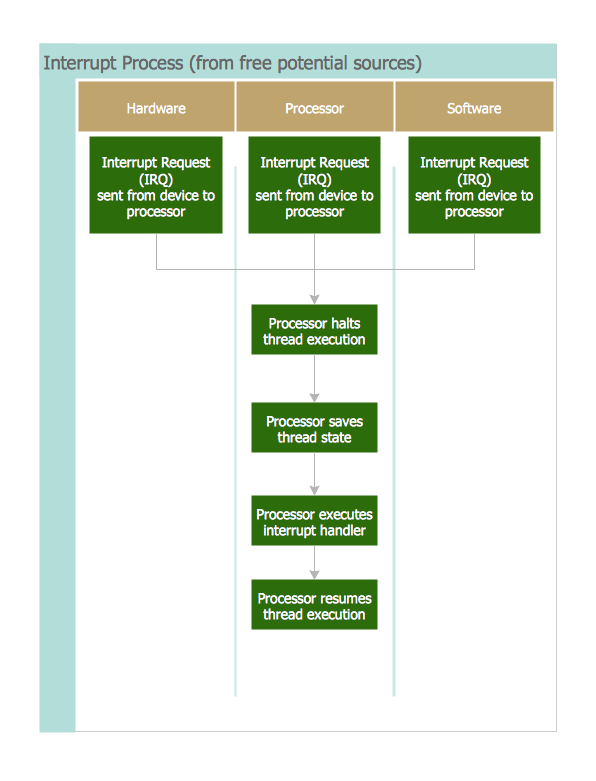 Event-Driven Process Chain Diagrams are simple and easy for understanding. They are widely used in the IT field and software development. But it is needed the special stuff training for creating and understanding of EPC Diagrams. It is a disadvantage of this type of flowcharts. IDEF (Integrated DEFinition) is a methodology of the modeling the complex systems in the field of software engineering. IDEF diagrams were introduced in 1981 as part of the ICAM (Integrated Computer-Aided Manufacturing) project. The IDEF family includes the IDEF0 - IDEF14 methods, that have the wide range of uses, such as the functional modeling, the object-oriented analysis and design, the knowledge attainments. IDEF0, IDEF1X and IDEF3 are the most used and widely recognized components of the IDEF family. IDEF0 is functional modeling method that describes the business processes, models the decisions, actions and activities of the complex system or organization. IDEF0 is based on the SADT (Structured Analysis and Design Technique). It is the result of the program of the computerization the industry, which was proposed by the US Air Force. IDEF0 notation was standardized in 1993 by the National Institute of Standards and Technology of the United States Department of Commerce. Influence diagram (ID) is a graphical and mathematical representation of the decision. It is a generalization of the Bayesian network. Influence diagrams are hierarchical. They are the alternative to the decision tree. Influence diagram represents the directed acyclic graph with three types of nodes (Decision node, Uncertainty node, Value node) and three types of arcs that connect the nodes (Functional arcs, Conditional arcs, Informational arcs). 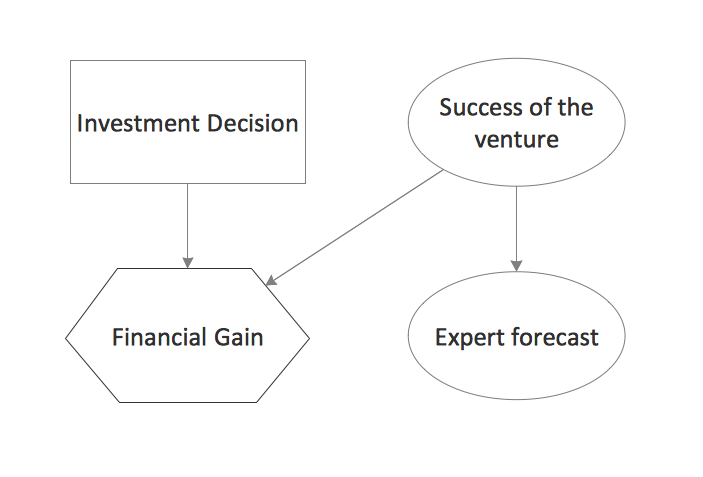 Influence diagrams are widely used in the decision analysis and in the game theory. 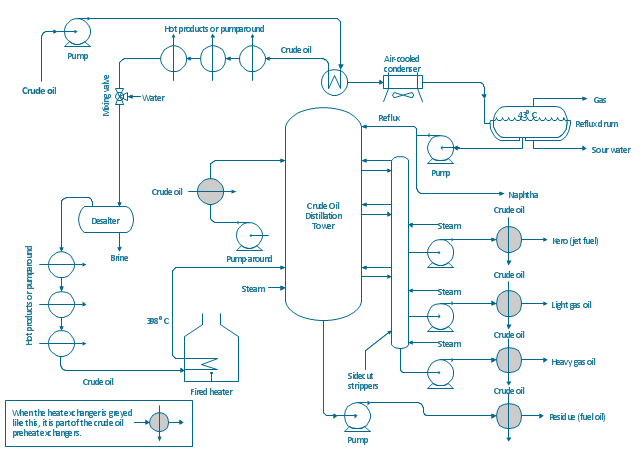 Process Flow Diagram (PFD) is a flowchart that illustrates the high-level processes in chemical industry and process engineering. PFD displays only the major plant processes not focusing on the insignificant details or components. Process Flow Diagram can show single or multiple processes. PFD that displays multiple processes is called schematic flow diagram or block flow diagram. Specification and Description Language (SDL) is a specification language for creating specifications, descriptions of the behavior, data, and inheritance for real-time systems. SDL is used for creating the object-oriented diagrams, visualizing the processes of the state machines for the systems of communication, telecommunication, automotive, aviation and medical industries. Specification and Description Language provides the graphical Graphic Representation (SDL/GR) and the textual Phrase Representation (SDL/PR). For creating the SDL diagrams are used the building blocks such as: system definition, block agent, process. Block agents consist of the process agents and communicate using the channels. 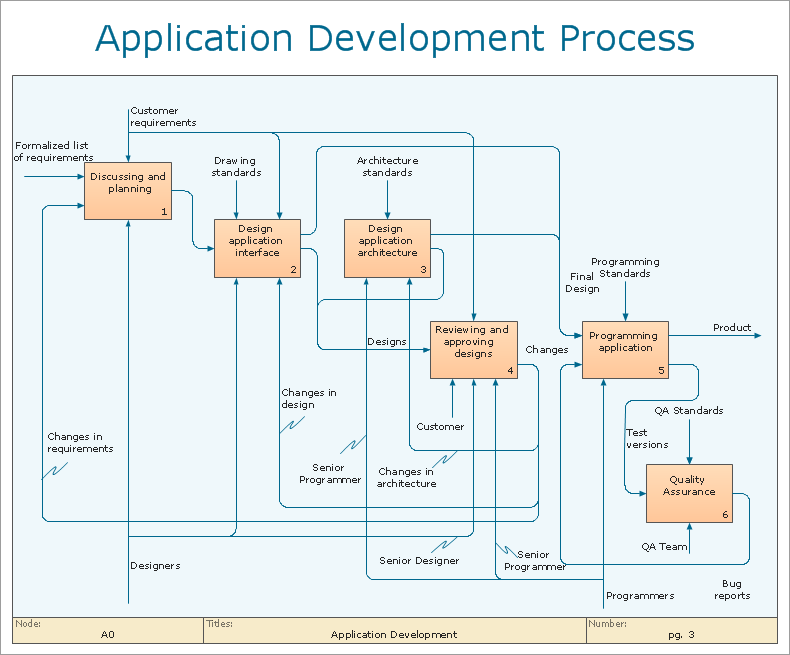 A process agent is a state machine. A few block agents form the system agent. The message to the agent from another agent or the environment is called a signal and is placed in a queue (the input port). Value stream mapping supports the methods of the lean manufacturing that are used for analyze and design the flow of the materials and information at the system level. This as a result brings the product or service to the consumer. The lead time is a key indicator associated with the value stream mapping. Value stream mapping are widely used in manufacturing, logistics, product development, software development, healthcare and in other service industries. Value stream mapping is also used as a part of the Six Sigma methodologies. 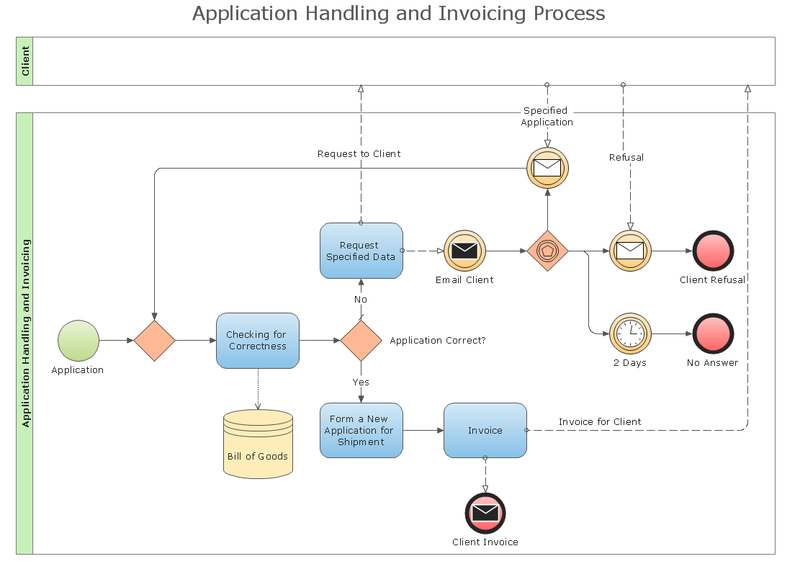 Workflow Diagram is a graphical description of the information flows, the relationships between the processes of information processing and the objects that are the part of these processes. 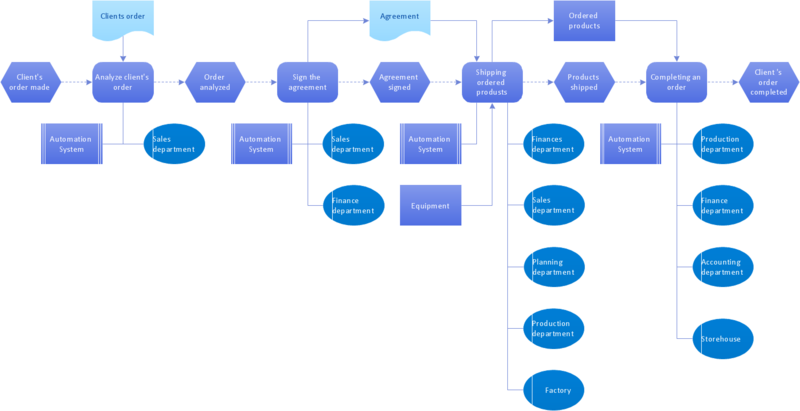 Workflow Diagram describes the stages of the business or manufacturing processes from the initial to the final stage that allows the organization to trace the progress of the processes quickly and clearly. For drawing the Workflow Diagrams are used the following shapes: ovals that represent the workflow begins and ends, rectangles that show the process activity, circles that show the connectors from one activity to another and diamonds that signify the process of the decision making. 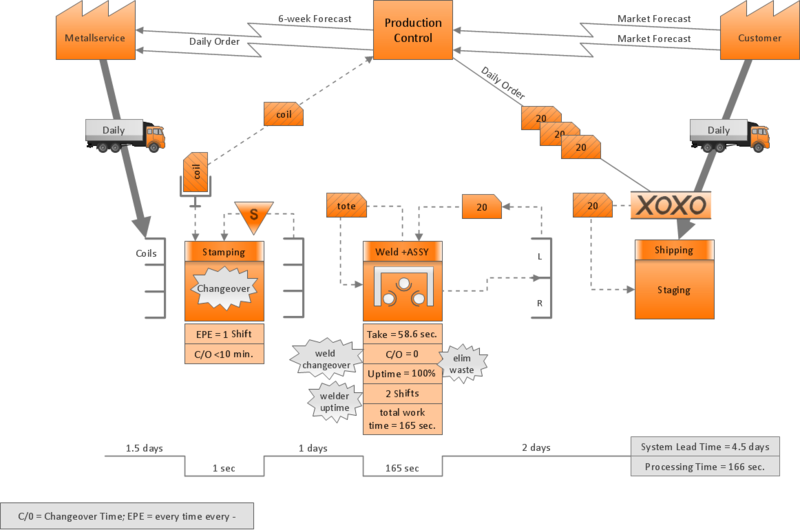 Workflow Diagrams are important part of the business process management (BPM). House of Quality Matrix Software - Use the predesigned objects from the Involvement Matrix Objects Library from the Seven Management and Planning Tools Solution to create professional looking House of Quality Matrices in minutes.